Every Wednesday, Eaglemoss draws back the curtains on a handful of upcoming Star Trek starships. While nothing was in the hopper this week, the Company did announce plans to produce yet another subscription-based series — this time around offering busts of several major Star Trek characters. The first is, of course, Captain Kirk, as he was portrayed in the Original TV Series (TOS) by William Shatner. Each bust stands between 4.5″ to 6″ tall, comes with a full-color magazine, and carries a MSRP of $29.99. Kirk is holding both a communicator and a hand-held phaser and is wearing a gold-tone uniform befitting a command officer. The first bust is tentatively scheduled for a fourth quarter release, so get your gold-pressed Latinum laid out in neat piles ready for processing. I have to admit that when I first laid eyes on the Eaglemoss rendition of a Star Trek Discovery Klingon Bird-of-Prey I was a bit mystified. To me, it looked nothing like I was expecting and resembled something from a different sci-fi universe. Apparently, the sample was photographed from a strange angle, showing off little in the way of detail and an oddly-shaped configuration to boot. Happily, the manufacturer has finally uploaded a couple of more acceptable images of the starship, which better shows off the craftsmanship that when into the replica as well as the angle of its dihedral wings. Expected some time in June, we anticipate brisk sales of this replica now that everyone can better appreciate what is in the offing. Priced at just $24.99, and bundled with a full-color magazine, these warships have become the de facto standard other replica navies have had to sail past to gain their own place in the sun. Hot off of Comic-com here in New York City, Eaglemoss was kind enough to provide us with several updates concerning several of their continually expanding intergalactic lines. First off, their convention exclusive USS Aventine, which was the subject of a fan-based petition, has a ship date — we expect the ship to arrive in November. If you haven’t already pre-ordered the ship we strongly suggest you do so since its become one of the critical ships in the Star Trek line. Next up, the Nostromo, the center piece of the all-new Aliens and Predator ship line, also has a street date — look for it in December. Only 3,000 pieces are being made, each with a numbered certificate of authenticity. And the hits just keep on coming. Late this afternoon, one of our distributors informed us that many of the previously sold out 1:43 scale Eaglemoss military vehicles are returning to the battlefield this October, many of which were either available in very limited numbers or not at all. According to the literature, this will likely be a “come as you are party” meaning they will likely get only one shipment and no restocks. We are currently in the process of changing the status on those items listed in our Eaglemoss section from “Sold Out” to “Back Order” so you may place your orders as soon as possible. If you previously ordered any of these vehicle but not got your order filled, we strongly recommend you contact us immediately to see if you would still like these items or perhaps add to your order. We will be placing our order with the distributor tomorrow, so we advise taking a look at the Eaglemoss section and your backs orders as soon as possible before we transmit our order. How Do You Spell Eagle(mas)? Every so often we run into a situation where we get short shipped a few items. 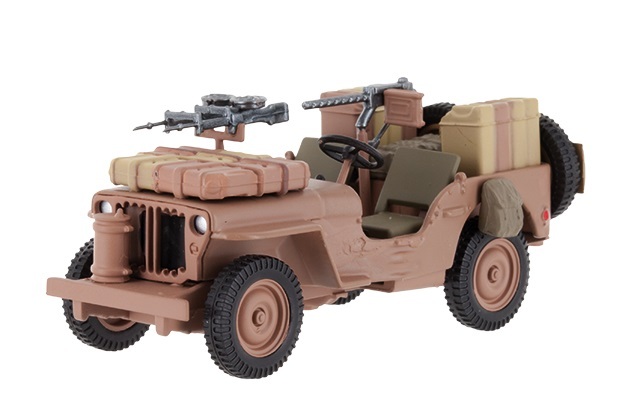 In the case of Eaglemoss, we learned today that several items in their partworks line that we had been expecting in the August/September time frame won’t be materializing, chief among them the 1:43 scale Bren Gun Carrier. Likewise, we got short shipped the Studebaker truck in CIAB livery, although we will be able to fill a few orders based upon the date we received them. Our distributor hasn’t given up hope, so there’s still a chance that they will locate another cache of these items, thereby enabling us to fill a few more orders and possibly offer the product up for general sale. Anyway, one of the lessons learned from this unhappy happenstance is that it pays to submit pre-orders early. We fill orders based upon the date we receive them, in a sense rewarding those customers who place their orders ahead of the product being received rather than dallying on the sidelines waiting for a timely opportunity to arise. Again, by using a credit card, you have nothing to lose since we do not charge you until the merchandise is ready to be shipped out. If you decide to pay by PayPal or use a debit card then that’s a different story, since each brings with it its own set of circumstances discussed in detail on our First-Time User Information page.